With all sorts of festivals which spread throughout the year, there's always one that can fit well into your travel plan. You are bound to find fun-filled festivals in Singapore all round the year, right from the start to the very end of the year. Some of these festivals are eye-opening and jaw-dropping while others heart-thumping and down right mesmerising! Singapore is a country that never fails to keep you on your feet. The following are the significant festivities marked on the Singapore event calendar, some of which are celebrated by locals and tourists alike. If you are planning your trip to Singapore, make it a point to join in the fun with the locals. Take note of the dates of these events and be part of the Singaporean culture. Do not fret if your trip fails to coincide with the festivals; these festivals in Singapore come and go every year, so if you miss them this year, there's always the next! If you are hoping to catch the locals in the celebratory mood, anytime will be a good time to visit Singapore. 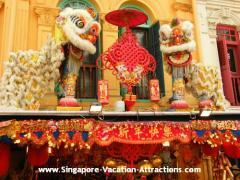 There are cultural and Traditional Festivals in Singapore all year round. Being a country rich of culture from the various ethnic groups, Singapore is also a country to visit for a vacation unlike no other. From the start of the year, the Chinese will celebrate Chinese New Year. As one of the major festivals in Singapore, it is celebrated together with the River Hong Bao Festival, the Chingay Parade and the Chinese Festival of Arts - Huayi. They also celebrate the Hungry Ghost Festival, and MoonFest - A Mid-Autumn Celebration together with the Mid-Autumn Festival Light up, both of which go along with the annual Mid-Autumn Festival. As for the Indians, the two most symbolic Indian festivals in Singapore will be masochistic and ritualistic Thaipusam in January and Festival of Lights - Deepavali at the end of the year. Lastly, Singaporean Malays take Hari Raya Puasa most seriously. This is one of the most significant Malay festivals in Singapore they celebrate every year, marking the end of their fasting month called Ramadan. Singapore as a nation in itself has coined its own culture - the Singaporean culture! Apart from traditional festivals, there is also a whole line-up of other festivals in Singapore. If you see 'GSS' splattered everywhere around town, you know you are in for a retail treat! The Great Singapore Sale (GSS), taking place from late May to July, is a nation-wide event to further boost Singapore's reputation as a shopper's paradise. The sale is massively spread throughout the country with Shopping Malls and departmental stores offering discounts you don't get to enjoy like any other. Be dazzled by the exclusive two-weekend-only Singapore Night Festival which takes place at the open space outside of National Museum of Singapore, starting from evening and passing through midnight. Indulge in an extravagant outdoor experience with theatrical performances featuring live music and dance, and an awesome series of light installations. This is a family event that is definitely not to be missed! You will also enjoy FREE admission to all galleries at the National Museum of Singapore, Peranakan Museum, Singapore Art Museum (SAM) and SAM at 8Q till 2am. Every year in the month of July, the best of authentic Asian culinary fare is whipped up especially for this food festival in Singapore. Witness a series of favourite Singapore Food which include local food like Chinese, Malay, Indian and Hawker Food, and an array of epicurean delights come together to give Singaporeans and visitors a tantalizing experience for their taste buds. This annual gastronomic affair takes place in the month of July, so whet your appetite just in time for a delightful treat! Singapore's birthday or independent day, otherwise known as National Day, falls on the 9th of August every year. It comes as no surprise that the nation celebrates this day with a big bang! Every year, a National Day Parade (NDP) will be held in the evening with tens of thousands of spectators come together, witnessing hours of live parade performances with a line-up of music, arts and dance. This is perhaps the only day of the year where most of the business operations will seize to function - offices, shops and even eateries will be closed. Those who are not able to make it for the parade get to watch it from the comforts of their home on any of the live-screenings on local TV channels. With the entire country glued in on the celebrations, the National Day event is simply too heartwarming to be missed! On your mark! Get Set! Go! You know it's time to put on your speeding gear with the Singapore Grand Prix Season taking place every year during the month of September, as part of the Formula One(F1) night race - the one and only night race in the whole world. There is nowhere else you should be but right here! Let the adrenaline junkie in you break free and don't let this electrifying experience zoom past you! We all celebrate Christmas, but no one celebrate Christmas the same way Singapore does. For a change, why not visit Orchard Road this December for a celebration unlike the atypical. Watch how a simple shopping district transforms into a festive wonderland as the streets and Shopping Malls in Orchard get into the spirit of Christmas. Shopping centres doll up in their own unique thematic costumes while the streets are made beautiful with colourful decor and lighting. Falling during the months of May and June every year, the Singapore Arts Festival celebrates cultural arts in all forms - from international dance ensembles to music and art installations. Esplanade Theatre on the Bay, together with museums and shopping centres all over Singapore will morph into a massive stage for performances of contemporary and avant-garde artistic displays. Come and enjoy one of the most significant music festivals in Singapore and marinate in a cultural spectacle that will leave you breathless! The Singapore International Film Festival, happening every year from mid to end April, is one of Asia's key festivals in Singapore, celebrating the film industry, and screening up to 300 serious and provocative films from 45 countries all over the world. Focusing on the best of cinematography from Asia, Middle East, Europe, North America and Latin America, this film festival acknowledges and gives credit to the best Asian films and filmmakers during its very own Silver Screen ceremony. If you enjoy the nightlife and are glued in on the clubbing scene, ZoukOut is an event in December not to be missed. This 10-year running dance festival in Singapore is perhaps one of the biggest and the most extravagant outdoor beach parties ever to hit Asia. The star studded line-up of world renowned DJs like James Lavelle, and Tiesto and Armin Van Buuren; and local big names like DJ Aldrin, djB and Andrew Chow, are enough reasons to be part of this head-bobbing occasion. Held annually at Siloso Beach Sentosa, ZoukOut is one of the most acclaimed music festivals in Singapore that draws in crowds and gathers avid clubbers from all over the world, to a party where they can dance and express themselves from night to the break of dawn!